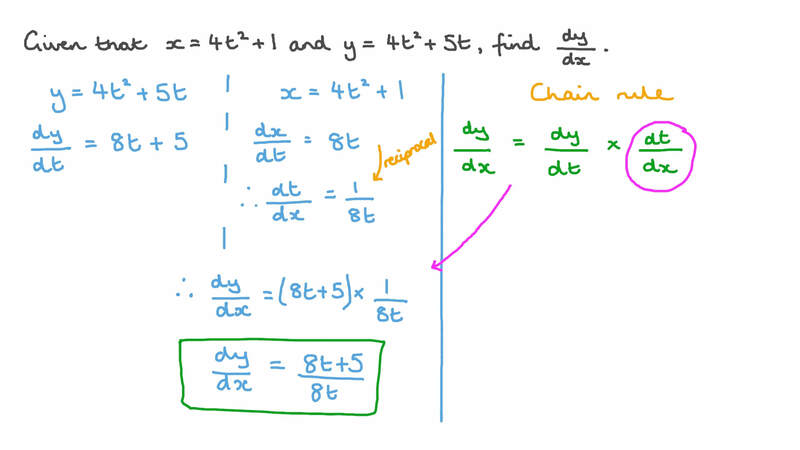 In this lesson, we will learn how to calculate the derivatives for parametric functions, such as first and second derivatives. Given that 𝑥 = 3 𝑡 + 1 3 and 𝑦 = 5 𝑡 − 𝑡 2 , find d d 𝑦 𝑥 . Given that 𝑥 = 4 𝑡 + 1 2 and 𝑦 = 4 𝑡 + 5 𝑡 2 , find d d 𝑦 𝑥 . Given that 𝑥 = 3 𝑒 5 𝑡 and 𝑦 = 𝑡 𝑒 − 5 𝑡 , find d d 𝑦 𝑥 . Given that 𝑥 = 5 𝑡 − 4 𝑡 l n and 𝑦 = 4 𝑡 + 5 3 𝑡 l n , find d d 𝑦 𝑥 . Given that 𝑥 = 𝑡 c o s and 𝑦 = 2 𝑡 s i n , find d d 𝑦 𝑥 . Given that 𝑥 = 𝑡 c o s and 𝑦 = 2 𝑡 s i n , find d d 2 2 𝑦 𝑥 . Given that 𝑥 = 2 𝑡 4 + 𝑡 and 𝑦 = √ 4 + 𝑡 , find d d 𝑦 𝑥 . Given that 𝑥 = 3 𝑡 + 1 2 and 𝑦 = 3 𝑡 + 5 𝑡 2 , find d d 2 2 𝑦 𝑥 . Given that 𝑥 = 𝑡 − 𝑡 l n and 𝑦 = 𝑡 + 𝑡 l n , find d d 2 2 𝑦 𝑥 . Given that 𝑦 = √ 4 𝑥 − 5 2 and 𝑧 = 5 𝑥 + 9 2 , determine 𝑦  𝑦 𝑥  + 𝑧 𝑥 d d d d .
Given that 𝑥 = √ − 𝑡 + 5 and 𝑦 = √ 2 𝑡 + 1 , find d d 𝑦 𝑥 at 𝑡 = 0 . If 𝑦 = 𝑥 √ 5 + 𝑥 2 and 𝑧 = √ 5 + 𝑥 5 𝑥 2 , find 5 𝑧 𝑦 𝑥 + 𝑧 𝑥 2 d d d d .
Given that 𝑥 = 5 𝑡 𝑒 𝑡 and 𝑦 = 3 𝑡 + 4 𝑡 s i n , find d d 𝑦 𝑥 . Find the derivative of 7 𝑥 + 4 𝑥 s i n with respect to c o s 𝑥 + 1 at 𝑥 = 𝜋 6 . Find d d 𝑦 𝑥 at 𝜃 = 𝜋 3 , given 𝑥 = 5 𝜃 + 7 2 𝜃 c o s c o s and 𝑦 = 7 𝜃 + 4 2 𝜃 s i n s i n .
Find d d 𝑦 𝑥 at 𝜃 = 1 6 , given that 𝑥 = − 9 2 𝜋 𝜃 s i n and 𝑦 = − 4 2 𝜋 𝜃 c o s .
By using parametric differentiation, determine the derivative of 5 𝑥 + 𝑥 − 2 3 2 with respect to 4 𝑥 + 8 2 . Given that 𝑦 = − 7 𝑡 + 8 3 , and 𝑧 = − 7 𝑡 + 3 2 , find the rate of the change of 𝑦 with respect to 𝑧 . Find the derivative of 𝑥 − 6 𝑥 − 9 with respect to √ 8 𝑥 + 1 at 𝑥 = 3 . 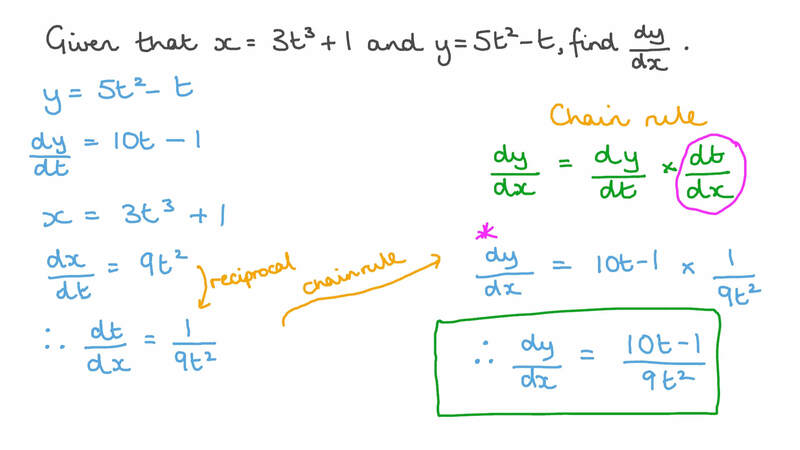 Find the rate of change of ( 𝑥 + 2 ) ( 𝑥 + 7 ) with respect to 𝑥 − 2 𝑥 − 7 . Find the rate of change of l n  − 3 𝑥 − 1  4 with respect to  − 6 𝑥 − 5  2 at 𝑥 = 1 . Find the equation of the tangent to the curve 𝑥 = 5 𝜃 s e c and 𝑦 = 5 𝜃 t a n at 𝜃 = 𝜋 6 . Suppose 𝑥 = − 3 5 𝜃 + 1 3 s e c 2 and 𝑦 = − 3 5 𝜃 − 1 4 t a n . Find d d 𝑦 𝑥 when 𝜃 = 𝜋 4 . If 𝑥 = − 8 𝑡 − 8 5 and 𝑦 = √ 𝑡 5 6 , find d d 𝑦 𝑥 at 𝑡 = 1 . A curve has parametric equations 𝑥 = 7 𝑚 + 5 𝑚 + 𝑚 + 4 3 2 and 𝑦 = 6 𝑚 − 6 𝑚 − 8 2 . Find 𝑚 for which the tangent is horizontal.